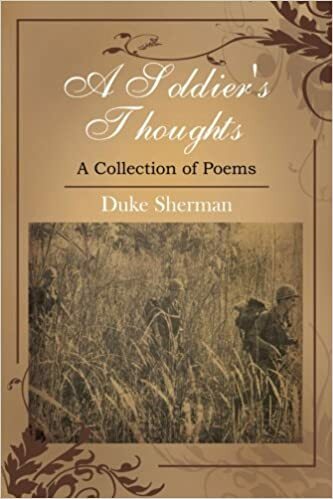 A Soldier’s Thoughts: A Collection of Poems by Duke Sherman is an interesting, decent sized assemblage of poetry. Each poem captures different parts of his life. In doing so, Sherman shares intimate thoughts, feelings, and aspects of his life with the reader. His poems run the gamut of his experiences as a soldier, PTSD, depression, and about his love life and other life experiences. Intertwined through these poems are also spiritual and religious messages and beliefs along with some political beliefs. Sherman is honest in sharing his life with the reader and does not hold back any of his thoughts. This book is a hefty book of poetry. It deals with feelings and experiences of one man’s life. In the beginning, it offers an introduction where the writer speaks of the many different definitions of what makes a soldier. One can be a person who has fought in the military, while the other is someone who has fought hard in their life. Sherman is depicted as a soldier in both senses of the word. Reading through Sherman’s poetry, you get a sense for the man himself. Not only do you get deep, intimate thoughts, but the reader also gets the author’s introspection and strong belief systems. A book of poetry in this sense is telling of the person’s character and a sense of who they are. Reading Sherman’s words was like an autobiography given in fragments. The poems are broken up in different formats, which flow nicely. The rhyming of the poems gives each one a nice rhythm as well. I learned a lot reading the collection. Much of it was thought-provoking. Sherman is a veteran. Because of this, he wrote a series of flashbacks detailing the destruction he saw in war. As a result, there was a lot of patriotism mentioned. It really made you think about how soldiers were and are currently treated and what patriotism means to certain people. One of the aspects of the book that was interesting was the disjointed way in which the poems were presented. There was no chronological time in which each poem was presented; it jumped around. At one point, there would be flashbacks as a soldier in Vietnam, and then at another point, it would be talking about one of his many loves or children. I felt that it was a good metaphor for how thoughts are often loose and disconnected, especially when recalling memories. The way it was written really made me feel as if I was in Sherman’s head. I could also tell that the way he wrote was a way of healing, which is what poetry is about. It is an art form that some like to share with others. I could definitely feel the intensity of his feelings through his written word. I would recommend this book for anyone who may be interested in what it is like to be a veteran or to learn more about war as it is a deeply personal account. Posted on December 26, 2018, in Book Reviews and tagged a collection of poems, A Soldiers Thoughts, alibris, author, author life, authors, barnes and noble, book, book club, book geek, book lover, bookaholic, bookbaby, bookblogger, bookbub, bookhaul, bookhub, bookish, bookreads, books of instagram, booksbooksbooks, bookshelf, bookstagram, bookstagramer, bookwitty, bookworks, bookworm, depression, duke sherman, ebook, goodreads, ilovebooks, indiebooks, kindle, kobo, literature, love, nook, novel, patriotism, poem, poetry, politics, ptsd, publishing, read, reader, reading, religious, shelfari, smashwords, soldier, spiritual, story, veteran, vietnam, war, writer, writer community, writing. Bookmark the permalink. Leave a comment.